Is the Moon Transparent? Nikon P900 Footage of Moon and Stars! ..yet not a single live cam of Earth??? WTF? 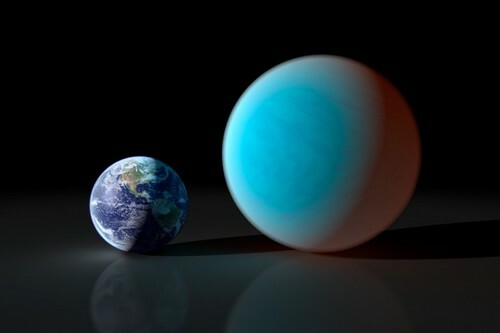 Discovered in 2004, 55 Cancri e, at twice the Earth’s size and eight times its mass, is called “Super Earth”. Aside from graphite and other silicates, its main component is diamond. It is made of crystallized diamond, with 1/3rd of its mass being pure diamond. Once a star in a binary system, its partner started eat at it, leaving only the gem core. Its temperature is 3900°F. Its Earth value is $26.9 nonillion, 384 quintillion times Earth’s GDP of $74 trillion. Mining only 0.182% of it would pay off the total debt of $50 trillion of all the governments in the world. They just have to travel 40 light years. There are almost 2000 exoplanets in the universe that have so far been discovered. The remarkable features of many of these strange and mysterious planets outside the solar system often leave the world of science absolutely confounded, when fact about the universe and it hidden planets sound stranger than fiction. ….then they are holding a 5 day conference in Aspen, CO to share their “knowledge” with other PHD astronomers…..Unflippin’ Real that anyone can BeLIEve the sheer idocracy of such an assertion in itself~ The lies have to keep getting more and more massive as they must keep coming up with “new” discoveries to justify the stealing of trillions of dollars from all the willfully ignorant. The passage was marked this month by the first major meeting on FRBs, held in Aspen, Colorado, on February 12–17. As well as celebrating a fleet of searches for the signals, the meeting’s 80 delegates grappled with how best to design those hunts and pin down the signals’ origins and precise distances. The trajectory mirrors that of astronomers 20 years ago when they were getting to grips with γ-ray bursts, which are now a staple of astronomical observation, says Bing Zhang, a theoretical astrophysicist at the University of Nevada, Las Vegas. “The meeting has really focused the field a lot,” says Sarah Burke Spolaor, an astronomer at West Virginia University in Morgantown. Debates continue over how to root out detection bias and coordinate observations and on what can be learnt by studying patterns in the existing FRB population. The first FRB was co-discovered in 2007 by astronomer Duncan Lorimer at West Virginia University. He found in archived pulsar data a 5-millisecond radio frequency burst that was so bright it couldn’t be ignored. Astronomers have since seen 25 FRBs. All are brief radio signals, lasting no more than a few thousandths of a second. They seem to come from sources across the sky and beyond our Galaxy. Some last longer than others, and the light from a few is polarized. Dwarf galaxies host fewer stars than most, so tracking an FRB to one is surprising, says Berger. He thinks that the unusual environment is more than coincidence, and that FRBs may come from super-powerful magnetars—dense, magnetic stars thought to form after an abnormally massive explosion, such as an extremely energetic supernova. Studies suggest that such events seem to be more common in dim dwarf galaxies, he says. Others think the bursts might come from active galactic nuclei, regions at the centres of some galaxies that are thought to host supermassive black holes. Streams of plasma from these could comb nearby pulsars to produce FRBs, says Zhang, which could also explain a recent, although tentative, observation of a faint γ-ray burst coinciding with an FRB. At the meeting, some astronomers proposed reversing the search strategy, and looking for FRBs in similarly strange galaxies, as well as trying to locate the origin of single bursts when they occur. And heated debate arose over whether all FRBs are likely to come from the same kind of source as the repeater, and so whether astronomers might detect repeated signals from all FRBs if they look for long enough. “The answer was definitely maybe,” says Burke Spolaor. But there could be different kinds of sources, leaving open the question of how much one repeater can teach about FRBs in general, she adds. A major issue is how to avoid bias. The fact that they were discovered by researchers looking for pulsars — small, dense, rotating stars—could bias the generation of theories about FRBs: astronomers might be drawn to models involving objects similar to pulsars. Detection bias is also an issue, in part because many FRB searches are piggy-backed onto those that are optimized for finding sources within the Milky Way that repeat regularly, rather than sporadic extragalactic events. The more astronomers look, the more they find FRBs in unexpected locations and with unusual features. To ensure that astronomers are seeing a representative sample, they need to look for signals across a broader range of frequencies, says Burke Spolaor. They should also pay more attention to the polarization of FRB light, she adds, which can provide clues about the environment of the source. 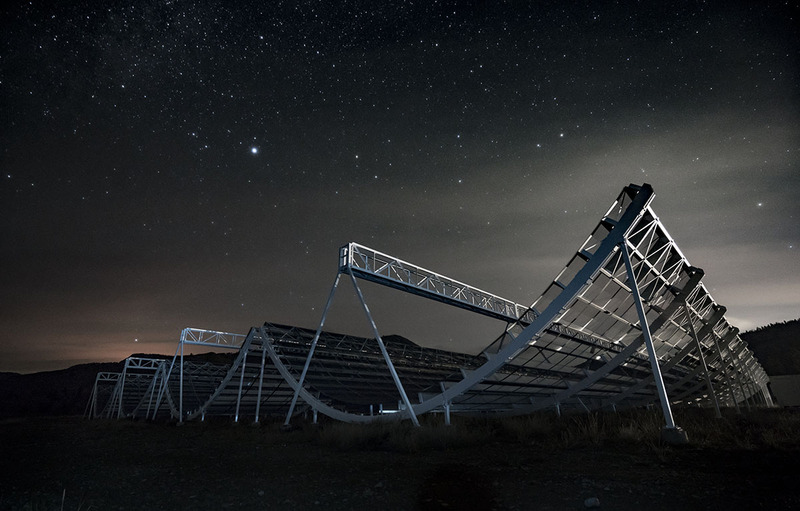 About 30 telescopes are looking for FRBs, and dedicated searches are increasing. The conference buzzed with excitement about the Canadian Hydrogen Intensity Mapping Experiment (CHIME), a radio telescope in Canada that should start hunting for FRBs later this year and could see as many as a dozen a day. But observations need to be better coordinated, says Berger. Delegates planned efforts to automatically release FRB results in real time for follow-up by other telescopes, as is already done for other kinds of fleeting astronomical signal. This article is reproduced with permission and was first published on February 28, 2017. Mr. Tesla noted that this ‘ether’ was everywhere moving and dynamic and the salvation of humankind. He also stated “with the power derived from it, with every form of energy obtained without effort, from stores forever inexhaustible, humanity will advance with giant strides”. Mr. Tesla was unrivalled for his innate understanding of the ‘natural laws’ that govern the Earth. 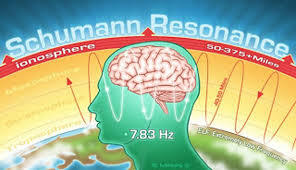 First and foremost is the Aether, and within that Aether is the existence of electromagnetic fields that interconnect all species of life to the Earth’s frequency (Schumann Frequency). Below is partial list of Electromagnetic experiments that have been compiled based on Tesla’s work. At the core research is the interplay of electromagnetism and the health of earth and all its varied species. Nikola Tesla said: “The day Science begins to study nonphysical phenomena, it will make more progress in one decade than in all previous centuries of its existence.” He was the sage who was capable of uniting science with the metaphysical. He had supernatural senses, and he was trying to explain to humanity that there are all these different forms of the same energy available for us. 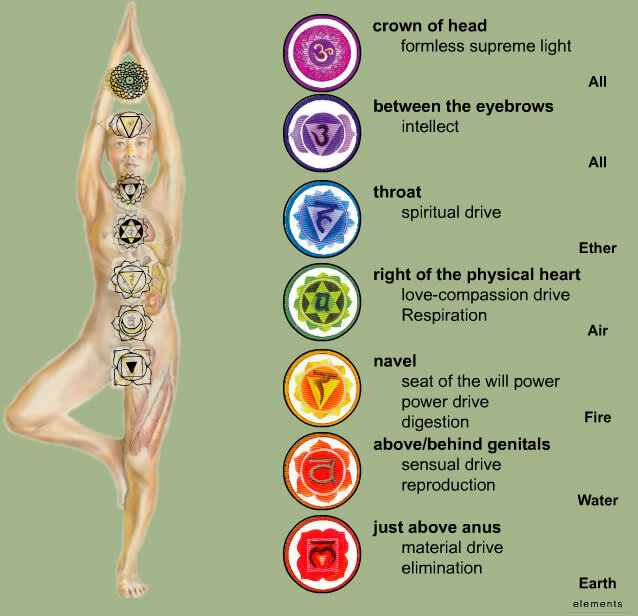 We only need to find out how to access them without disturbing the laws of nature. That is why those in control wanted to erase him from the history, because they could not put meter on free energy and charge for it. Tesla considered that any infringement of cosmic space, or the magnetic field of the Earth, was an infringement of harmony inherent to natural laws. This made him stand up against using the use of atomic energy. In addition, he believed, the absence of ethical components in science has had the consequence of negative influences on people’s free will, which makes it destructive. According to Tesla, free will can be creative only with kindness, which accompanies the higher understanding and conscious selection of positive intentions. He considered that humankind living on the Earth should understand all kinds of natural alliances with Earth – otherwise people would lose it. The inside of the ionosphere layer is used in wireless information transfer to bounce off waves emitted by transmitters on the Earth’s surface. In this way the information can be transferred over large distances. The physicist and inventor Nikola Tesla was the first to carry out wireless energy experiments at Colorado Springs, USA, which produced such powerful electrical tensions that they resulted in the creation of artificial lightning. These lightning flashes also produced radio waves. Due to their extremely low frequency these waves could penetrate the Earth without resistance and thereby Tesla discovered the resonance frequency of the Earth. Unfortunately, Tesla was before his time and his discoveries were not taken seriously. According to heliocentric theory, there are two poles that are activated by a deep iron molted core at Earth’s center. This core, said to be as powerful as or suns allows Earth’s magnetic shield to function and protect us from harmful sun rays. How then can science possibly know that the Earth core is made up of Iron? In reality, the deepest drilling operation in history, the Russian Kola Ultradeep, managed to get only 8 miles down. 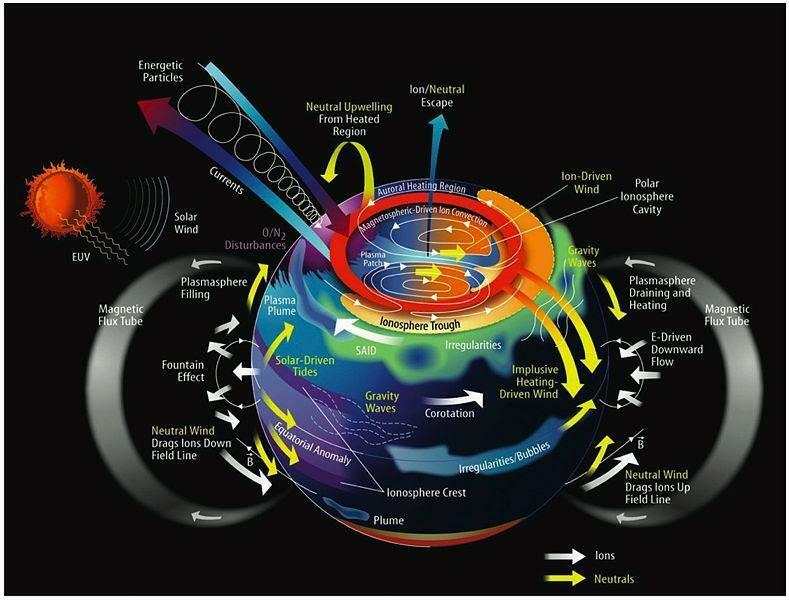 This makes the entire ball- Earth model taught in schools showing a crust, outer-mantle, inner-mantle, outer-core and inner-core layers are all purely speculation as we have never penetrated through beyond the crust. I’m rethinking how to distribute the Flat Earth books and wish not to deal with overseas sales, shipping, pay pal, checks, post office, mailers, postage, ordering books, storing books, labor, etc…. The books are coming out of Create Space, a subsidiary of Amazon…sorry to have to use the monster but I thought worth it to get this important book out. I really like how its turned out and am proud to offer it. Bottom line, check back to this site. Final proofing now. Much of Flat Earth logic, thought, and reason are available to those that wish to confirm FE theory for themselves while at the same time disproving heliocentrism as a viable cosmological possibility. During the 1st quarter waxing moon, when you can see it rise over the Eastern horizon, observe the Sun at sunset relative to the light atop the moon. The Sun is to your opposite shoulder than the moon and the light of the moon never changes through the alleged Earth movement away from the Sun at dusk. 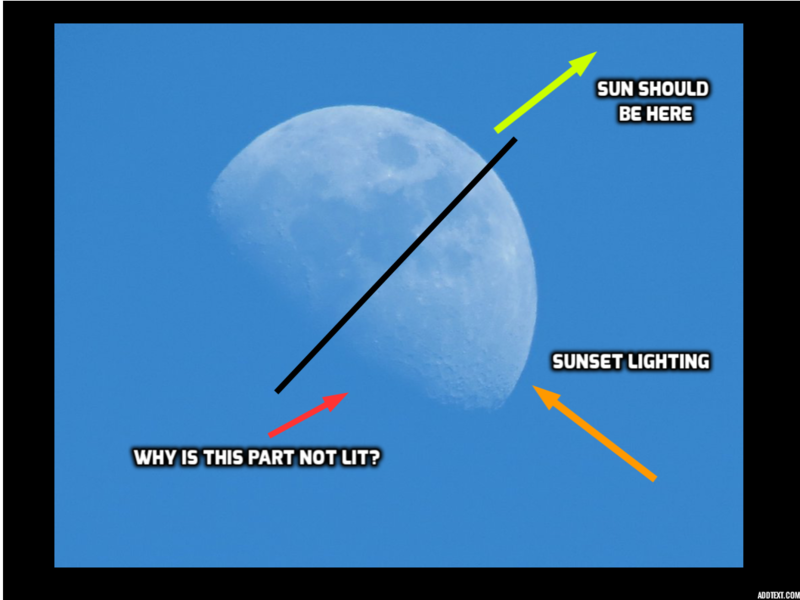 You will clearly see the lit moon is from the top, not from a lower angle where the Sun is located. Take a plastic round bowl and put in a sink with stopper in place. Place plastic opening face down and pour water from the top while holding down the bowl. Once water has filled to the top of the bowl you can let go and see how Earth could be inside a dome filled with air, yet completely under water at the same time. Look at the moon during its half-phase through a telescope, or high zoom camera, and see stars for yourself through the dark portions of the moon. Go to the ocean and look out. On a clear day with unobstructed vision, you can see some 10 miles scanning to the left and right. Basic spherical geometry says we should see at least 66 feet of curvature and a cresting ocean directly ahead. Do you see any curve at all? Aero-plane. Sea-Level. Plate Tectonics. Hemisphere. As you increase in altitude in an airplane, a hot air balloon, or some other aircraft, the distant horizon always stays at eye level no matter how high you go. The Earth never, ever falls away from your eye as a round ball curve should. Not only that, it stays at eye level in all 360-degrees around you. This can only happen on a Flat Earth. The Earth is not a globe. Observe clouds at sunset and in moonlight. How can clouds be hundreds of thousands and tens of millions of miles away, if we can see them form behind the Sun and moon? Take a high-powered camera or binoculars or telescope to a large lake or ocean. Watch a ship go past the horizon of visibility with the naked It ‘appears’ to go off a round surface as the ships mast falls away last and the hull disappears first. This is one the main problems the ancient Greek philosopher Aristotle had with empirically supporting geocentric theory. Now, relocate the ship or vessel through the viewing device and you will see the object coming back into full view, hull and all. 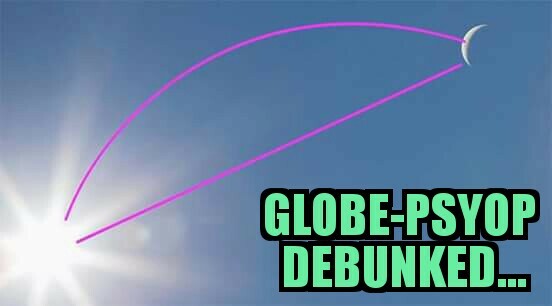 This is the Law of Perspective and proves Flat Earth, not round ball globe. Lay out at night and stare at the Northern Star. Watch all the other star’s orbit around the fixed North Star. Except for the fixed North Star, all stars move around us on Earth. We are the at the epi-center of this Creation and the Universe.